I hardly ever post twice in one day but today isn't just any day. Today is Joanne's 39th birthday! I got to visit with her last week and it did my heart a world of good. She has made AMAZING, ASTOUNDING, MIRACULOUS progress in the last several weeks but she can still use your prayers!!! Especially as she begins rehab and faces surgery next week. In Joanne's honor, I'm posting 39 things that remind me of her! 4. My Nike+ iPod thingy. 12. This cross stitch piece. She has one VERY similar to mine. 16. This cute pie bird. I want one! It's amazing the things that I've come across in my day to day life these past two months that continually remind me of Joanne and remind me to pray for her. Happy Birthday, Joanne. I know you're not super thrilled about celebrating your birthday in the hospital, but every single day you're one step closer to HOME! You can do this!!! I'm amazed at how she is doing. I love that you got to see her. Still praying for her (and you!). So glad you introduced me to Joanne via the blog world! I'm even more excited that you have had a chance to visit with her & that she is making progress! God is good!!! Hi Meredith! It's so sweet when mundane things remind us of dear friends. 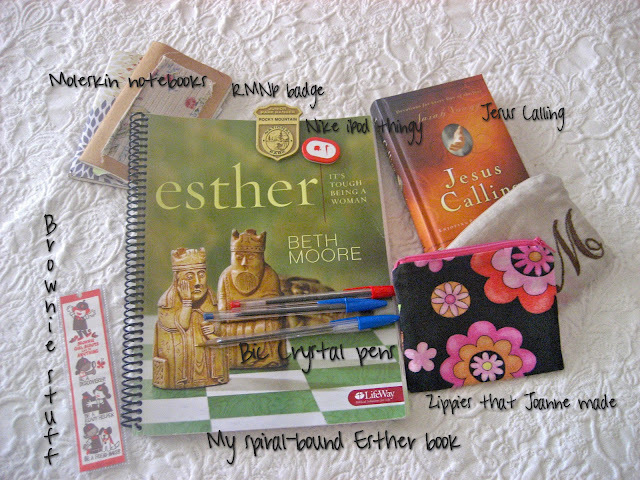 I love the spiral Esther notebook. My Bible study is just getting ready to do that one, and I'm a little DIY challenged. Can you tell me how you did this? I think it would be fantastic...oh and if you say you just ordered them that way forgive me! Meredith! This is so sweet! You have inspired me to do this for a couple of my closest friends. This is a great list! I have a feeling I would really love knowing Joanne! This post?? Made me smile from ear to ear. YOU are a good friend, Meredith...and I could write 100 things about you, too. Blessed to know you both and call you friends!